Clark students involved in organizing the invitational mock trial tournament: back row, Jacob Hunnicutt, Alexandria Ross, Jess Cushman, Matthew O’Hara, Rachael Chen, Zoe Brammer, Archit Goyle, Rachael Howe, Owen Ganter and instructor Steven Kennedy; middle row, Hannah Cooper, Amanda Quinones, Sadie Murray, Juliet Michaelsen, Julie Reed and Aitana Doster; front row, Marlee Faranetta, Jane Thomas, Jordan Blocher, Yenifer Cabreja and Alicia Ireland. Judges for the tournament included several Clark alumni and friends. The coach for the two teams is Steven C. Kennedy ’88 (pictured above, at right, with the two student teams), a practicing attorney and trial lawyer who teaches the Trial Advocacy class for Clark’s Law and Society program. 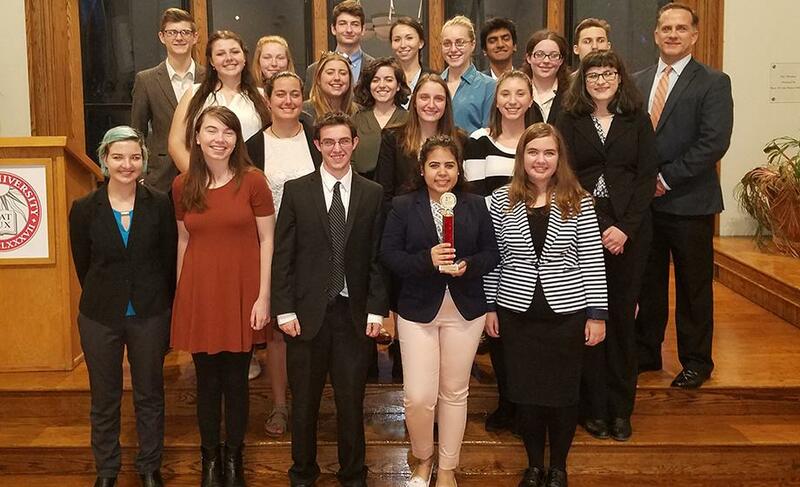 One of Clark’s two teams finished second, and three students won individual awards: Zoe Brammer ’21, Marlee Faranetta ’21 and Rachael Chen ’19. Quinnipiac University’s team finished first. “A lot of work goes into each tournament. Individually, the work involves writing direct and cross examinations, developing speeches, and creating character for witnesses. As a team, we have to make sure both sides of the case are cohesive from open to close, and we have to anticipate opposing arguments to our theories,” says Chen, who has participated on Clark’s mock trial team for three years, this year serving as captain. Juliet Michaelsen ’20 is captain of the second team. Like many of the students who participate in mock trial tournaments, Chen hopes to go to law school. “Mock trial has helped to familiarize me with general courtroom procedures and legal language, which are skills that I will take into my life post-Clark,” she says. More than 300 colleges and universities nationwide compete in mock trials throughout the year as part of the American Mock Trial Association, which prepares alternating national criminal or civil cases for the teams to argue and defend. Each team consists of six to 10 students playing lawyers and witnesses. Winning teams advance to regional tournaments in February and then on to sub-nationals in March, aiming to be one of 48 teams heading to the national championship tournament in April. Although Clark has hosted regional competitions, this was the University’s first sponsored invitational. 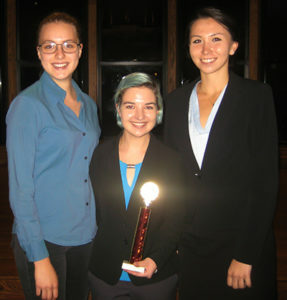 Students named the competition the Cougar Classic Mock Trial Invitational Tournament.